I was able to find all the color candy coating I needed at Walmart. They carry the Wilton, Chocomaker, and Candiquik brands. I used Birthday Cake Oreos for the center, but you can use regular Oreos. If you choose to do Double Stuf Oreos, you will need a different mold. 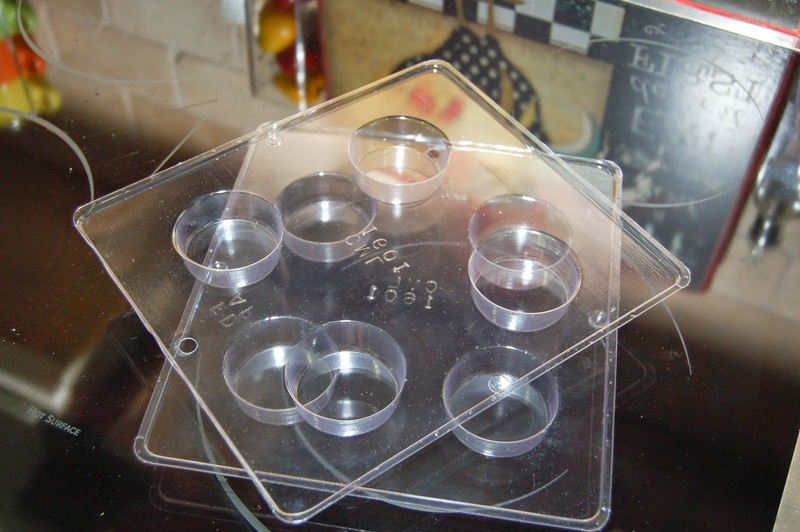 I bought these candy molds at a small culinary shop while I was up north, but they also sell similar ones on Amazon. They are made for candy coating Oreo shaped cookies. I bought four sets of molds so by the time I finished the last cookies, the first ones were ready to pop out and I could continue using the mold. This was my first time trying this. It was a learn as you go process. I poured about a tablespoon or so of candy melt into the mold, then pressed an Oreo cookie into the middle and twirled it around to cover the sides. Then I added candy melt to the top and flattened it out with a spatula. By the second tray I had figured out not to overfill the cavities. You have to tap the mold a few times against the counter to get the air pockets out and that also levels out the candy melt. I placed them in the fridge to harden quickly. You have to work a little to loosen the hardened candy from the mold, but it didn't take too long. 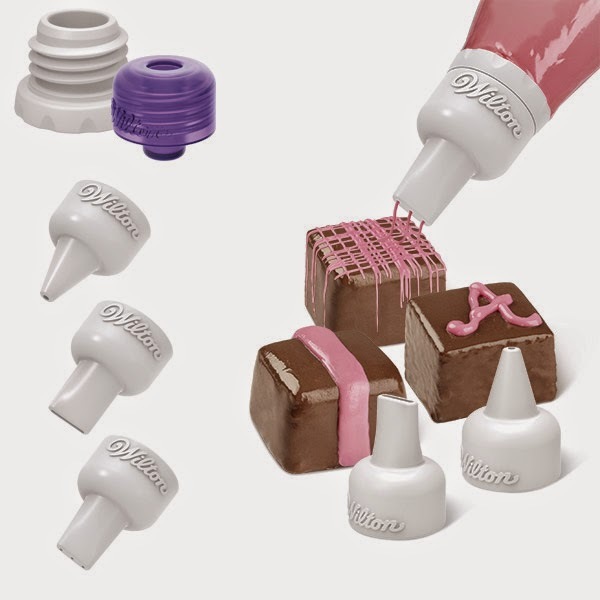 For the "M's", I bought the Wilton Candy Melts Decorating Tip Set at Walmart. The writing tip worked perfect. I printed some "M's" on my computer and placed the printer paper under a piece of wax paper and traced them the best I could. You could write directly on the candy coated M&M's, but I was too scared to mess them up. 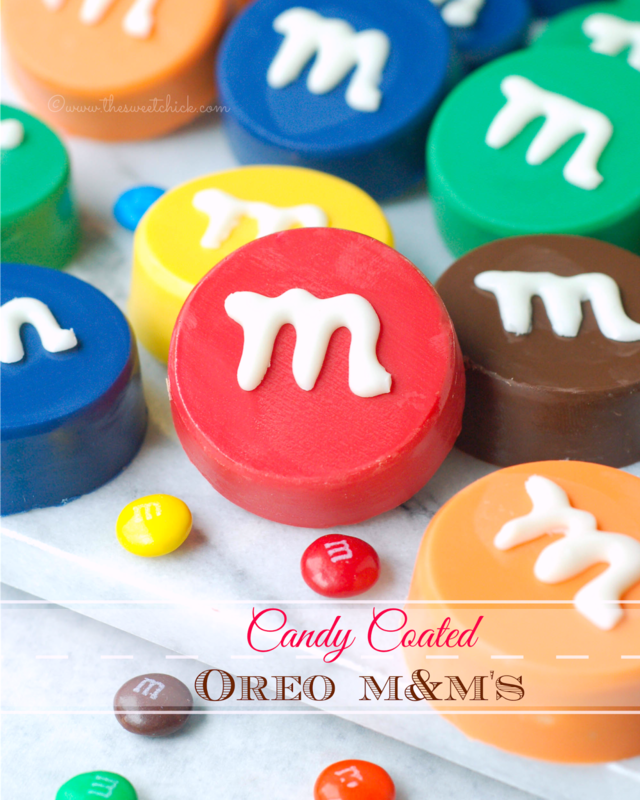 When the candy "M's" had hardened, I attached them to the Oreos with a few dabs of candy coating. 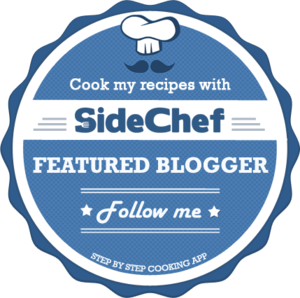 I made these as treats for the party, but they make great party favors also. You can place them in little bags or boxes and make some cute tags to attach to them. All the party guests loved them. 1 box (12) Wilton's Disposable Candy Decorating Bags. 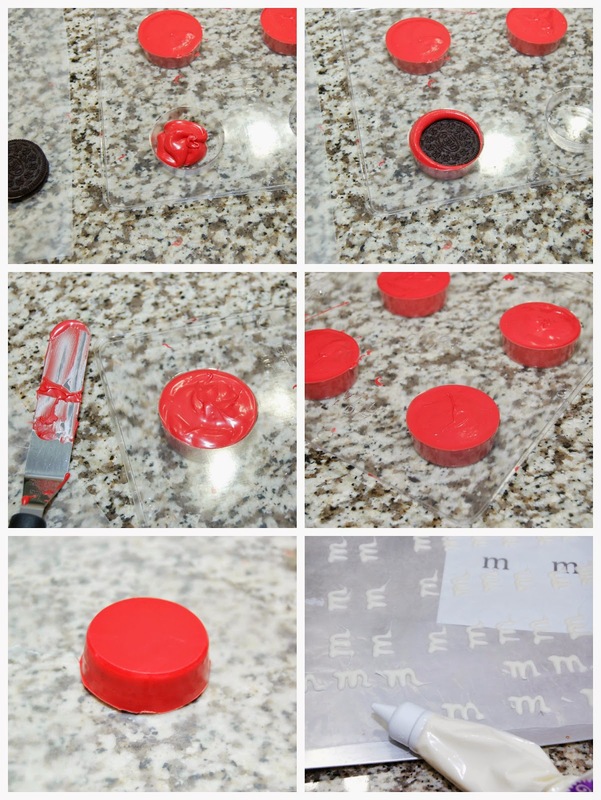 Using one color at a time, melt candy coating according to instructions on the back of the package. (Usually it's 30 seconds at a time in the microwave.) I melted a 1 cup at a time. You can always add more if needed. 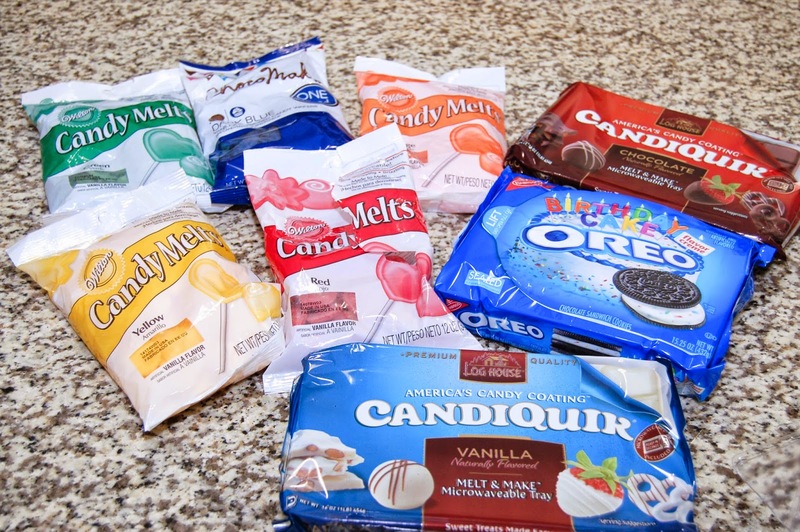 You will not use the entire bag of candy melt. Make sure you candy melt is warm, but not hot before pouring into the mold. Pour about 1- 1 1/2 tablespoons of candy melt into each cavity of the mold. ( I worked with one mold of 4 at a time). Place one Oreo cookie in the center of each cavity on top of the candy coating. Gently press the cookie down and spin is slowly to coat the sides. Add a bit more of candy coating on top of the Oreo, careful not to overfill. Spread the candy melt out with a spatula. Then gently tap the mold a few times on a hard surface to release any air bubbles. Place finished mold(s) in the fridge for 5-10 minutes to speed up the hardening of the candy melt. I continued the same process with another color while the first color was setting. I used 2 molds per color, so it worked out great. When the candy coating has hardened, remove from fridge and gently wiggle the mold to release the cookie. 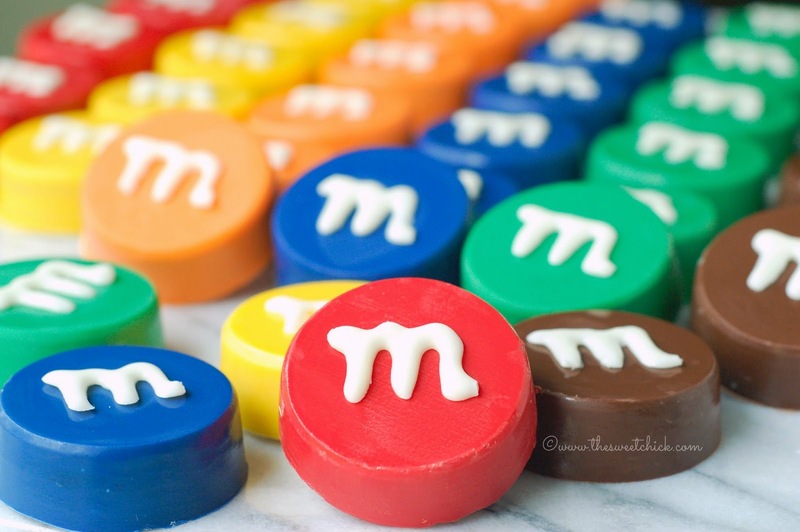 The flat surface will be the top of the "M&M". Once all the colors are done, it's time for the "M's". If you are confident about your writing skills, you can write directly on the candy coated cookies. I wasn't, so I made a template on my computer and printed it out. I placed the template under a piece of wax paper to write my "M's". My "M's" were about an inch tall. Melt the vanilla candy coating according to the package instructions and pour into a disposable candy decorating bag with writing tip attached. Trace the "M's" onto the wax paper over your template. Practice makes perfect. I placed my template and wax paper on a cookie tray so I could pop it in the fridge for a quick set. I also used a sharp knife to cut off any "tails" that occurred due to run-off candy coating. Once the "M's" have set, carefully remove from the wax paper, add a couple of dabs of vanilla candy coating to the backs and place them on your candy coated cookies. Let dry and you are done!